Aerosol sprays and paint cans exploded in a blaze at a recycling centre in Rotherham earlier today. South Yorkshire's emergency services have spent most of today dealing with a blaze at Universal Recycling, Wharf Road, Kilnhurst, after flames were spotted at around 10am. Around 500 tonnes of plastic, in bales, are involved in the fire. But when firefighters arrived there were a number of explosions as aerosol sprays and paint cans, stored in skips, also went up in flames. Representatives from the Environment Agency and Rotherham Council have also been at the scene of the blaze all day. Crews from seven fire engines and and a high volume pump are battling to bring the fire under control. Residents have been advised to close their doors and windows because of plumes of thick, black smoke - visible for miles - billowing from the recycling centre. An emergency cordon has been put in place. 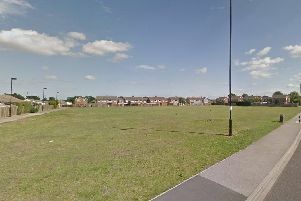 Police officers carried out welfare checks on residents in Kilnhurst earlier today and people have been urged to avoid visiting the area while the fire is still burning. Some residents worried about their pets in homes close to the fire were allowed back to retrieve them to take them to places of safety. Group Manager Andy Hayter, of South Yorkshire Fire and Rescue, said the cause of the blaze is not yet known. A full investigation into the incident is to be launched. "Crews responded to reports of a fire at the waste recycling centre and found 500 tonnes of baled plastic, like bales of hay, stacked up and well alight," he said. "In addition there were skips of aerosols and paint cans involved in the fire too, so there were a number of explosions early on. "There was a plume of black smoke as we were fighting the fire earlier, so to try to prevent that and to reduce the impact on the environment and local community we are attempting to smother the fire using foam instead of water. "We are working closely with partner agencies."